Along with Trump, Johnson said he also opposes the planned Trans-Pacific Partnership (TPP). Last week the House of Representatives voted on Fast Track authority for the Trans Pacific Partnership (TPP), twice. That’s right twice. The first time the bill overwhelmingly failed due to a number of concerns and political divergence. In a surprising maneuver they voted again on Thursday, this time removing a controversial aspect of the bill call Trade Adjustment Assistance (TAA), which provides workers whose jobs have been impacted by trade with federal aid. 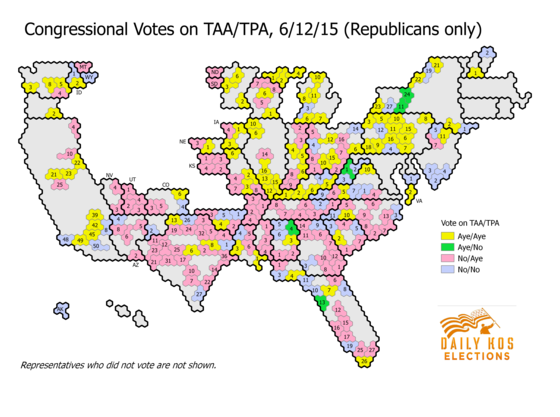 By removing the TAA the House passed a Fast Track bill, mind you not in a bipartisan manner only 28 democrats voting in favor of Fast Track. Let's see if I understand this: when Hillary Clinton changes her mind on TPP our local "newspapers" tell us how dishonest she is and how she'll say anything to get elected. When Republican Bill Johnson changes his mind, it's not mentioned. That takes care of the "fair" part; what about the "balance"? In an article that is supposedly about the candidate's opinions on trade agreements, Democrat Lorentz doesn't get mentioned until the 13th out of 16 paragraphs and his word count comes in at 21% of the total. Actually, I'm surprised that he received that much coverage -- Representative McKinley's opponent is never mentioned. A final thought. The meeting where both candidates expressed their views on trade occurred Thursday evening but the article about it doesn't get published until Monday morning. All I can figure is that the Pony Express rider who carried the news had a difficult time fording the Ohio River.